In my last post I mentioned that I’ve been craving brownies. That craving grew and grew and got to the point where something bad was going to happen if I didn’t make brownies. I even started to get mad at the other dishes I was making because they weren’t brownies. I made soup and hated it. It wasn’t brownies. I made muffins and hated them. They weren’t brownies. I made hot chocolate and… didn’t hate it entirely, at least there was chocolate. But it still wasn’t brownies. Then I found out that CandyRecapper was hosting this month’s Sugar High Friday and had chosen the theme of baking with candy. Bingo! 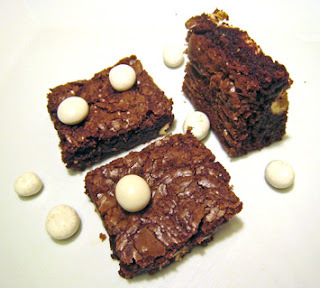 I figured I could throw some candy into a brownie recipe and kill two birds with one stone. Then I would be making brownies with a greater purpose than simply to satisfy my irrational cravings. I typed ‘brownies’ into the Epicurious.com search bar and saw a recipe for Brownies with Chocolate Covered Raisins. Chocolate covered raisins are all well and good, but I immediately knew I would be swapping them out for yogurt covered raisins, even though I knew this was a potentially bad idea. You see, I have a problem with yogurt covered raisins. I like them so much that I eat them until I feel sick and then vow to never eat them again. This resolution is futile and I inevitably end up overdosing the little devils again at a later date. It’s not even like yogurt covered raisins are that good. The yogurt coating is kind of waxy and artificial tasting but for some reason I’m drawn to them and never stop eating them when I know I should. I blame the fact that they’re predominantly sold in bulk form and that I have a very heavy scooping hand. Or possibly it’s the fault of the gnomes. They seem like they could be at the root of this evil… Uh yeah, gnomes. Anyways, I tried to curtail my snacking habit by throwing all of the yogurt raisins into the brownie batter so I wouldn’t have any leftovers but this only encouraged me to overdose on the brownies instead. Curses! I never win! Preheat oven to 350°F. Butter 8-inch square pan with 2-inch-high sides. Stir butter and both chocolates in medium saucepan over low heat until melted. Remove from heat; cool to lukewarm. Using electric mixer, beat sugar and eggs in medium bowl until very thick and pale, about 3 minutes. Stir in melted chocolate mixture and vanilla. Mix flour, baking powder and salt in another medium bowl. Stir into chocolate mixture. Mix in chocolate-covered raisins. Posted by Brilynn at 6:46 p.m.
Brownies are the perfect pairing for these. Oooh your brownies sound fun, we used to get YCRs in our breakfast cereal! Didn't know they were classified as "candy" though! I love yogurt covered raisins...and yes the texture is weird but it's still addictive. I wil have to have them with brownies. I thought you had a recipe for yogurt-covered raisins, haha :) I've never seen them before... Besides chocolate candy bars, I'm very much candy-deprived! (which is good, for, you know, the D-word) Looorve me some brownies! I would OD on these brownies too. They sound awesome. hWhat a great idea! I love yogurt covered raisins too. I keep telling myself that they're good for me because they're yogurt and raisins! I don't know how I could justify the brownie part, though. I love yogurt-covered raisins -- one of the things I discovered at Trader Joe's, and now I have to shut my eyes as I walk past them in the store or they will, somehow, fall right into my cart. What a great idea to add them to brownies. I don't like raisins that much, but that yogurt thing sounds good - and I can totally understand why you indulged with these brownies, they look fantastic! Brownies! I have literally dozens of brownie recipes printed out and every time I see another one I have to have it! 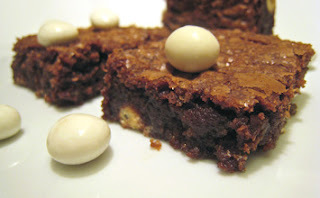 They look so good, I would never have thought to put yogurt covered raisins in brownies, what a great idea! Yeah, you made your brownies! Can I come over and help you to not overdose? I haven't made mine yet. The yogurt covered raisins sound like an awesome addition. I'm the same way with yogurt covered raisins - I can't stop eating them even though I don't really like them! I would have never thought to put them in brownies - what a great idea! Arrghhhh...this is like torture to watch! Those brownies look luscious! :) I haven't had a brownie in a looong time...too long! I used to buy the yoghurt covered malt balls when I lived in Az and they were sublime! Great idea to pair the yog-raisins with brownies Brilynn! hahaha! i overdose on candy corn that way. fortunately it's not available year round! those brownies look amazing! I agree , the yogurt covered raisins are dangerous. They sell them at the market we shop at and my husband and I could eat the whole bag at once. I love yogurt. I love raisins. I've never eaten yogurt covered raisins. What's up with that? This is an awesome recipe! What an interesting recipe! I love yogurt covered raisins as well. I understand completely about the raisins. Have you looked for them in health food stores? I once lived in a tiny village in the UK called Stonehouse that had a health store that sold AWESOME yogourt-covered raisins - made with real sweetened yogourt. When my consumption rate topped 1kg/week, I forced myself to stop. And I am not exaggerating - in fact, that may (ahem) be an underestimate. I wonder if chocolate covered almonds could be substituted. I secretly hope for fundraising groups to knock on my door so I can have my favourite addiction!! My kids like the yogurt raisins too, though currently they are on a "we only like the yogurt part of them" phase where the raisins come back in the snack box, having been sucked clean. I don't like of dislike yogurt covered raisins. I just never eat them. Is that dangerous to eat that many raisins? You know what I mean??? Every time I read your blog, I end up laughing! I made blondies with toffee bits, and had to work fast because I kept eating the toffee! And your granola recipe looks great - Master Chow loves granola, but isn't fond of coconut, and I didn't see any in your recipe. Will have to try it. now you remind me, yes, that yogurt coating sometimes is quite waxy, but for some reason it acts as "SK II" to the over-dried (mine are) raisins. Love the combo in your recipe! I have laughed with your uncontrollable craving. I have never tried yoghurt covered raising. maybe I hven't lived enough. lovely to be back here and read about your lovely creations. Sounds like a load of fun! Happy to share the overdose! Thanks for the recipe! I love those things and I rationalize them to the point that I'm pretty sure they're healthy. Hi there Brillyn, thanks for coming by my blog and for the kind words. These brownies look awesome! Thanks for the recipe! I went through a major yogurt covered raisin phase in college. Yes they're raisins, but they're not healthy. The worst part was I bought them from bulk bins, so there's no portion control at all. I may as well have been eating M&M's. Eventually I went cold turkey. YOur brownies look wonderfully fudgey--mmmm. I would never have thought to put yogurt covered raisins into brownies, but I'm imaging the taste in my mouth and I'm starting to salivate! I totally understand your dilemma. I have the same problem with chocolate covered raisins but even more so with chocolate covered peanuts. I find I eat yogurt covered almonds the same way- sounds dangerous! Mmm I love yogurt covered raisins. Too much! So I rarely buy them. Now I really want to try them in brownies, or muffins mmm. does anybody know how to make yogurt covered raisons or dates preferably? It's not actually yoghurt at all. It's white chocolate!!! Gasp! I've tried experimenting with making a mixture of white chocolate and icing sugar and coating the raisins and spreading it out on parchment paper, similar to how you'd make a chocolate bark. Good luck!